Dishonored Designer Urges Developers to "Specialize"
According to Harvey Smith, a game doesn't need to do everything - it just needs to do one thing very well. Every once in a while a new trend emerges in the gaming mainstream. Publishers will naturally want to capitalize on this: when online multiplayer exploded in popularity, every game had to find a way to include a competitive multiplayer component. Lately publishers have been pushing to incorporate social media tie-ins, because evidently that's where the market is. Harvey Smith does not subscribe to this trend-chasing theory. He doesn't think that the expanding market is killing old-school sensibilities. And as co-creative director on Dishonored (an offline single-player stealth game that was awarded Best Game at the BAFTAs), he should know. As Smith sees it, the interests of the gaming masses aren't shifting, they're just growing. "What the reality seems to be is we keep adding types of games and finding new player groups for those," he says. "The market seems to be expanding." 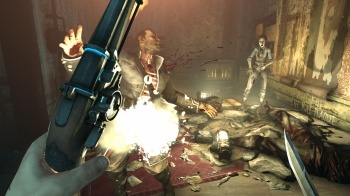 Smith admits that while some fans have complained about the lack of multiplayer in Dishonored, many more have expressed gratitude for the game's polished single-player experience. The rising development costs of modern games are one of the biggest obstacles to innovation - trends can generally be milked reliably for a while, but new ideas don't have as much guaranteed return on the investment. Interestingly, Smith hopes that increased costs will actually force game studios to try new things, rather than cling to whatever the current craze is. "I hope people are specializing and going deeper on given mechanics," he explains. "And I actually hope it gets to the point where there are so many people competing - indie developers and commercial developers - and they're so good at this one thing they do that in order to win, you have to differentiate. You have to do something well that the other guy's not doing. That'd be nice, right? Instead of a handful of games that all try to do the same thing, I hope there's some specialization happening and people are going to have to do one thing well or three things well instead of trying to do the same 12 things everyone else is doing." Smith and the rest of Arkane Studios are currently working on the next piece of Dishonored DLC, The Knife of Dunwall, which is due to launch on April 16.